After months of not running, I was finally able to run (and finish the run) again. My first run for the year was at Takbo.ph 20-Miler Run 2015. Takbo.ph 20-Miler Run 2015 was held in Bonifacio Global City on January 18, 2015. I registered for the 16k (10-miler) run. It was my first 16k run after more than three years. The last time I ran 16k was during Takbo.ph RunFest 2011. I finished the run and got another finisher medal after the run. This was also the first time I got a finisher shirt. This is the first time I used Moto 360 to track my run (via the Runtastic Android Wear App). From being fully-charged when I wore it before leaving for the run, it became low batery after more than two hours of running. The official race results are 2:18:04 (Gun Time) and 2:17:46 (Chip Time). Based from the Runtastic records, I ran 17.26 km in 2:18:21. It was a lot slower compared to my run at Takbo.ph RunFest 2011 (which was less than 106 minutes) but it was faster compared to my only practice run in Ayala Triangle a week before (more than 147 minutes for a 15+ kilometer run). Over-all, the run was good. 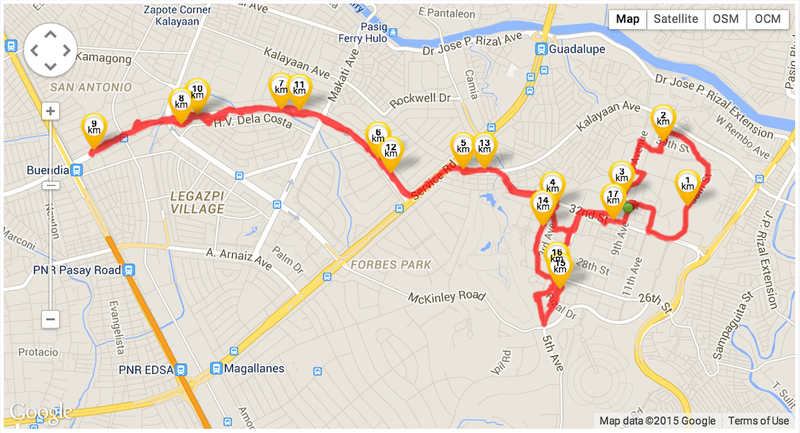 The route was from BGC to Buendia and back. I only hate it when runners have to stop for a few seconds to let vehicles cross the road. There were enough hydration but I feel bad because the water provider was Manila Water. There were Pocari Sweat hydration stations, but there were only two, I think. Aside from the drinks, there were banana and a bite-size packed adobo pie. Hopefully, I can run more this year.